Enok Groven was born and raised in Bergen, Norway. He works as an international model, and is very into Viking culture, including re-enactment and studies in Old Norse. In 2014, he participated in a history-based reality TV series in Norway and became instantly famous for his “I can do it!” approach to all challenges. He is also a dedicated environmentalist. Q: Now Enok, how did you get a spot on the team? Enok: I have known Lars for many years. 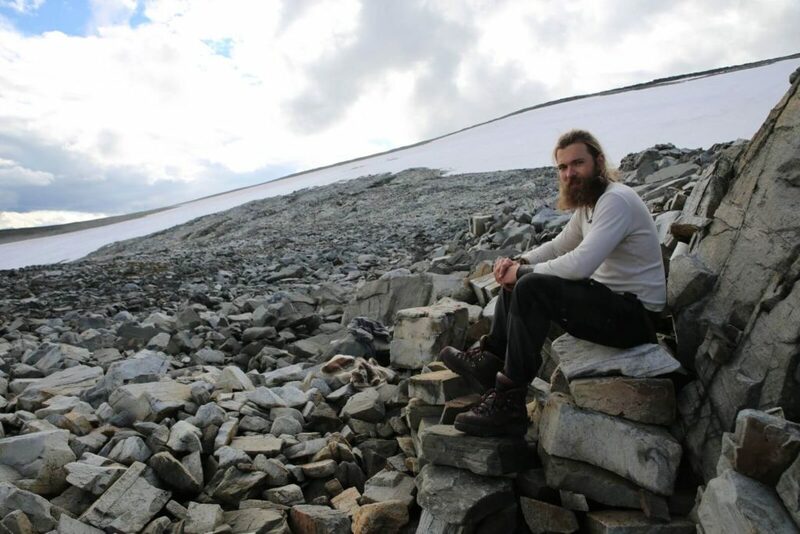 In 2011, Lars asked me if I wanted to take part in an archaeological expedition to rescue artefacts released by melting ice. I could not believe my luck! History and especially the Viking Age have been one of my main interests since I was a child. I accepted without thinking for a second! Enok on a photo-shoot in Diavolezza (2 978 m a.s.l. ), St. Moritz. I had just gotten a model contract the same year and was keen to exploit that opportunity. My model career went well and I worked a lot, so every August when it was time to join the expedition, I was busy working. One year, when I actually had the time, Lars called me and told me that the fieldwork was cancelled due to snow. Finally, in 2016, I found the time to join the team and fieldwork was on. In August later that year, I sat in a helicopter filled to the brim with equipment and excited archaeologists. Q: How did you get to the site? Enok: I met up with Lars and Espen in Lillehammer. We drove to the mountains and the closer we got, the more beautiful the landscape became. It was almost dark when we got to the mountain summer farm, where we spent the night. Early the next morning we got up, packed our stuff, and drove to an open field at the foot of a mountain. Soon a helicopter showed up above us. What a way to hike up a mountain! I had no idea archaeologists get to experience exciting things like these. I felt more like we were starring in an action movie or part of the Norwegian Special Forces. A hailstorm set in when we tried to land. It was quite exciting and felt a bit dangerous! Video from the first day of fieldwork and Enok’s first day as a volunteer. We unloaded the helicopter, saw it fly off, and started the ascent to the basecamp close to the ice. I had the glacier to my left, and I just had to start searching for objects only a few minutes after I landed! I was so keen to find something left there by the Vikings. It was after all the first time that I had that opportunity in my life! I do not like wasting chances here in life, and I was not going to waste this one either. After we arrived at basecamp, I helped setting up the tents. The rain was pouring down. I was already quite cold and soaking wet, and we had only been there for about one hour! How would I last for another week in this weather? For some strange reason I had not thought that it could rain up here at 1900 meters above sea level. After setting up all the tents, we got into the mess tent to dry up and drink something warm. 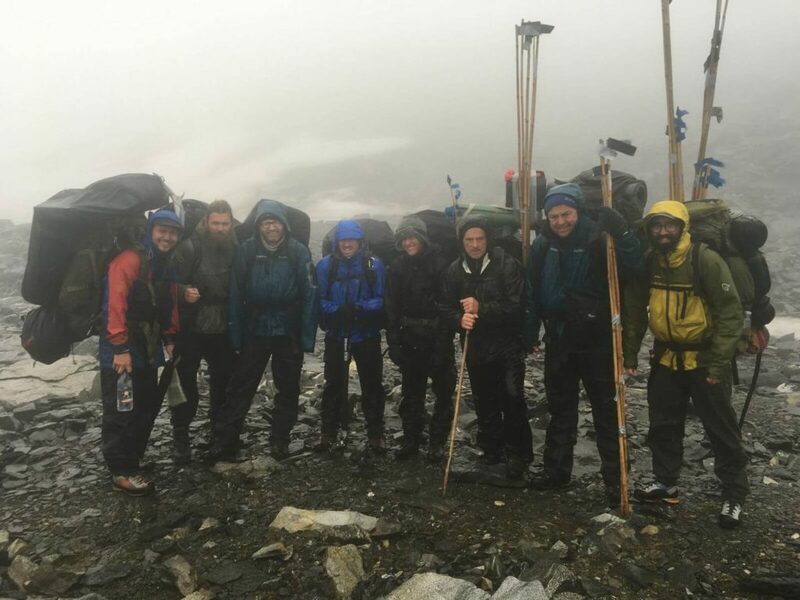 The first hours on this expedition had given me a strong impression of how hard life on the mountain could be, and that life as a glacial archaeologist could be challenging. What I did not know at the time: It was going to get much worse! Q: What was the first job you were assigned to? Enok: The first job they asked me to do was to build a latrine. The only material I had was stone, but my many years as a scout proved valuable since we learned how to be creative with the resources we have at hand. I had to follow certain rules. One of them was that I had to build the toilet far away from our campsite so it would not smell, and people would get some privacy. I think I put it a bit far away from the camp, but at least it was downstream. Enok enjoying the fruit of his construction work – a latrine with a view that is hard to beat. Easily the best latrine we have ever had! Photo: Espen Finstad, Oppland County Council. Q: What kind of archaeological work were you doing? Enok: I mostly surveyed. We went into a line with two meters between each person, and set off searching for manmade objects and animal bones. We all had to walk in the same tempo and straight forward, which was sometimes not easy because of big boulders. The work seemed quite monotonous at first, but after a while you got used to it. And each time we made a find, I forgot in a second the boring side of the search! It was amazing every time we found something. We had a finds group who came after us to collect the finds. Sometimes, we would stay and watch when they collected the object. I remember really well the first thing we found. It was a bone arrowhead, three thousand years old. I just couldn’t believe it! Enok in the line of surveyors, eyes fixed to the ground. Photo: Espen Finstad, Oppland County Council. Q: You are very careful to eat only ecological and non-GMO food. How did this work out during fieldwork, when other team members are so hungry that we jokingly say they will eat anything that does not out-run them? Enok: Well, I couldn’t eat what the crew prepared. On the other hand, it looked the guys enjoyed the Norwegian potato and saithe dumplings, and the wild and organic cured lamb sausage I brought! (Enok forgets his delicious homemade organic müsli, which did not survive for long) Cooking organic often means preparing something at home, since it’s hard to find organic food out there. During the fieldwork, I just had to prepare my own food, so energy and time wise it was not very efficient, but it tasted great, and it gave me a good feeling to eat it. Some people invest their money in stocks, I invest my money in my health, because without it there is no life, and you can’t bring any money to the grave. Organic food costs more, but it’s much better for the environment. 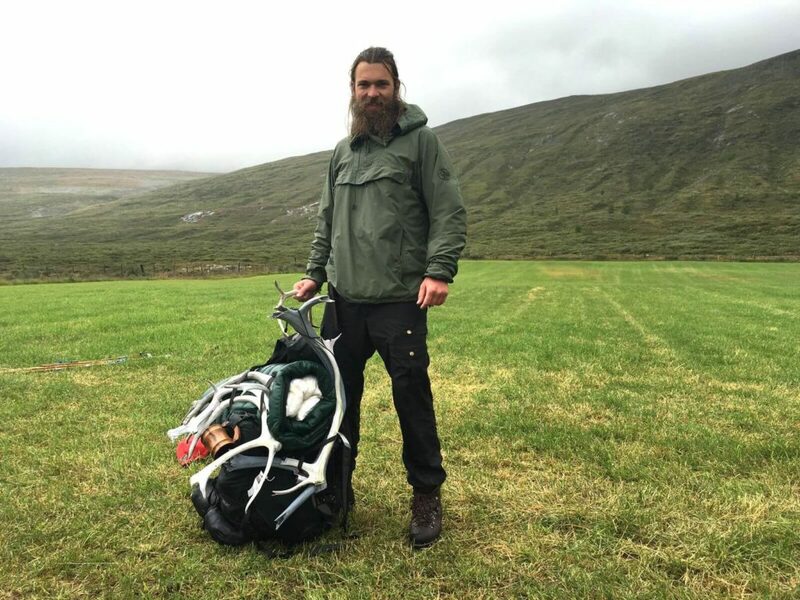 Many Norwegians use a lot of money on traveling, clothing, housing and technology. I have substituted the three last things with organic food. Q: What was your impression of the team? Enok: Archaeologists are great! They had a lot more humour than I expected. We laughed and joked a lot up there. Maybe it’s the nature and fresh air that makes them so happy? I guess it also has to do with the passion and drive they have. I just love passionate people, so I really loved being up there with such an incredible group. It did not take long before we developed our own jokes and humour. You know the types of jokes you cannot tell other people, because they have not been there and done that? Meeting a group like this really made me want to work with archaeology. Being the first person to see an item from our ancestors 3000 years ago is mind-blowing! Doing it together with great people makes it even more fun. At the same time, archaeology is hard work and much tougher than I expected. Oh, how I miss it now! It felt like we were on an expedition, especially when seeing the Himalayan praying flags waving in the mountain winds. Enok enjoying a moment of peace at 1900 m a.s.l. Photo: Espen Finstad, Oppland County Council. Q: The fieldwork ended in an evacuation. What happened? Enok: We got surprised by bad weather. The rain was pouring down some of the days up there, and then we got news that a storm was coming. 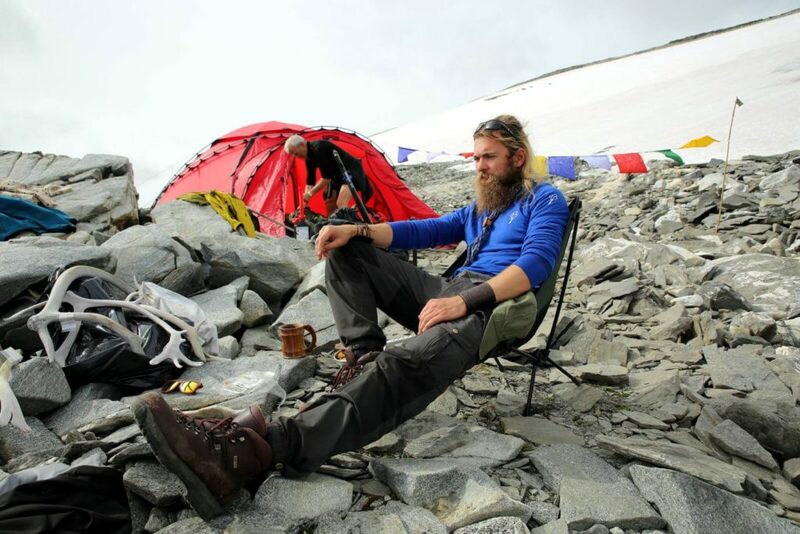 Lars and Espen collected the crew in the mess tent and told us that they had decided we had to break camp and finish the search early. It was clear that they did not like to make this decision, but being a leader is not easy. In the high mountains, one should prepare and expect the worst, and make safe choices. After all, we are not Special Forces! On the way down the mountain we all understood that they had done the right thing. Winds were rough, and the rain was making us all wet. I was soaked down to my underwear, and the rain was cold. If I wasn’t carrying a heavy backpack with all my camping gear + tent and many of the giant ancient reindeer antlers we had found, it would have been much colder. The Secret of the Ice team after breaking camp due to an in-coming storm. Check out Elling’s pack (outer left)! Q: The melting ice is releasing archaeological treasures, but there is a dark background to the finds. Being an environmentalist – what are your thoughts on the climate change challenges we are facing? Enok: It must be with mixed feelings glacial archaeologists find an object where the ice has melted away, when they know that we are causing the glaciers to melt. However, I am an optimist. With optimism and inspiration, we can open a lot of doors that lead to new pathways for the human race. With our new and effective ways of communicating and spreading knowledge, it is hard not to be positive towards the future. I think we will be able to change our ways before we face the most severe climate changes. We have to do something within the next 10-15 years in order to stop a climate change run loose. By that I mean additional global warming effects created by climate change itself, e.g. like the permafrost melting and releasing methane, leading to more warming. We have already won many fights, but we need to win many more, and that’s why we need more people to join us in the struggle for a better and greener world. The green movement has been too negative, and it has caused people to turn away from us. Now we have learned, and there is only one way forward, and that is to a better and more positive world. 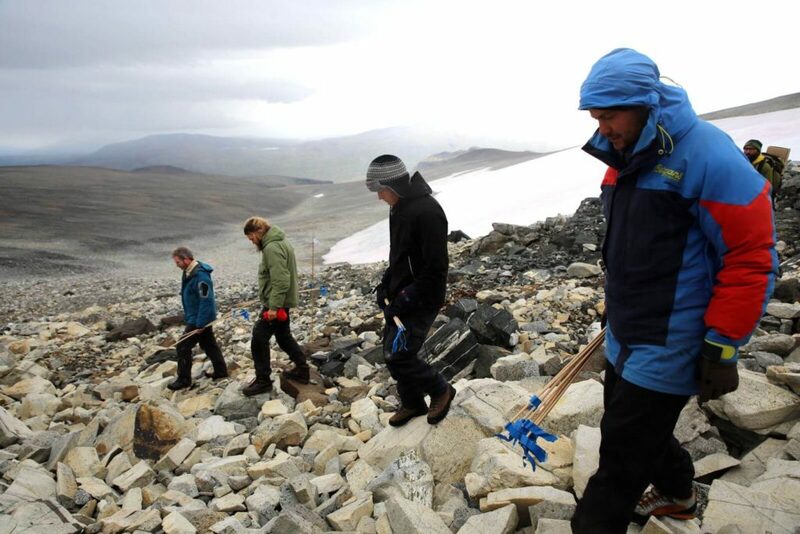 I hope that the finds from glacier archaeology can play a part and highlight the problem of climate change. Enok, smiling after coming down from the mountains after a week of glacial archaeology. Photo: Espen Finstad, Oppland County Council. Q: As you know, being a volunteer with Secrets of the Ice is a once-in-a-lifetime possibility, but if you got the chance, would you go back? We were very happy having Enok as a volunteer for Secrets of the Ice, and we wish him good luck for the future, both in his work as a model and in his fight as an eco-warrior. Check out his webpages here and here, and his Fashion Against Climate Change page here.